Our reception telephones are manned from 8AM to 1PM, and 2PM to 6.30PM. The Prescriptions Department and the Secretaries close earlier than this. If you are unable to get through to these departments, please speak to reception who will help. Please note that you must have a booked appointment to see a doctor or nurse - we do not operate a walk in and wait system. These can be booked in advance or booked on the day. If you have access to the internet, please register for Online Access - you will be able to book at a time that suits you, and it will free up the phone lines for people who do not have this facility. You must register in person so we can check photo ID. We are intending to offer early morning telephone consultations from April 2018 - you can request these or your GP may offer this as an option. Please ask reception for more information. Please note: The latest time stated in the above grid is when an appointment may finish, rather than the start time of an appointment. 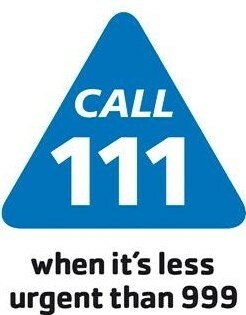 If you are unwell at any time when the surgery is closed you should ring 1-1-1. Please note this service is for urgent medical problems only. It is not for routine enquiries such as repeat prescriptions, booking appointments or test results.